In any given community there are always those who have extra and those who don’t have enough. We have seen some innovative methods for redistributing excess goods, such as Pumpipumpe in Switzerland — a scheme which sees residents place stickers on their mailbox to denote goods they want to lend to neighbours. 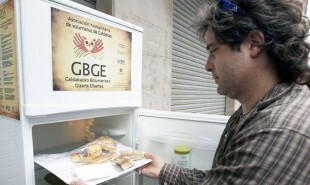 Now, the people of Galdakao — a small city in Spain — are using The Solidarity Fridge to redistribute food. The large white fridge sits in the middle of town, and provides a place for residents and restaurants to drop leftovers for their neighbors to enjoy. The Solidarity Fridge has already saved about 300kg of edibles from the trash in its first two month. The scheme can simultaneously tackle both food waste and hunger in the community, although the creators are keen to emphasize that it is not charity — anyone is welcome to help themselves to the food available. Volunteers ensure that any donations meet their regulations: foodstuffs must be within their sell by date, no raw fish, meat or eggs are allowed, and homemade dishes must include labeling about when it was made. The idea has already been replicated in other Spanish towns. Could this scheme work on a bigger scale?